It’s already May 17th, and time is running out if you want to get any of the Retiring stamps, cardstock, DSP, etc.! May 31st is the absolute last day to order, but if you wait too long, you just may be too late. See the complete, updated Retiring List Annual Occasions_NA_CA_ENG by clicking on this link. Remember, the stamps will continue to be manufactured until May 22nd, but after that, it will be ‘while supplies last’. Most of the retiring In Colour ink pads, refills and cardstocks are now gone, but there is still a good selection of embossing folders, punches, dies and embellishments available. Some things that you may not have noticed on the retiring list are the Glue Sticks, the Brayer, the Diagonal Scoring Plate, just to name a few. So be sure to take a good look at the list, so that you’re not disappointed, come May 31st! Also a good reason to stock up now, as I mentioned in a post last week, is that here in Canada, there is an overall average 7% price increase on everything in the catalogue, effective June 1st. So, you can stock up now on your basics, like Whisper White, Very Vanilla cardstock (and other colours, of course), your Stampin’ Dimensionals and other adhesives, and even the stamp sets that are not retiring, because they will be increasing in price, as well. While the increases are not drastic, to me, every little bit helps – I know I’m stocking up on the essentials I use all the time! 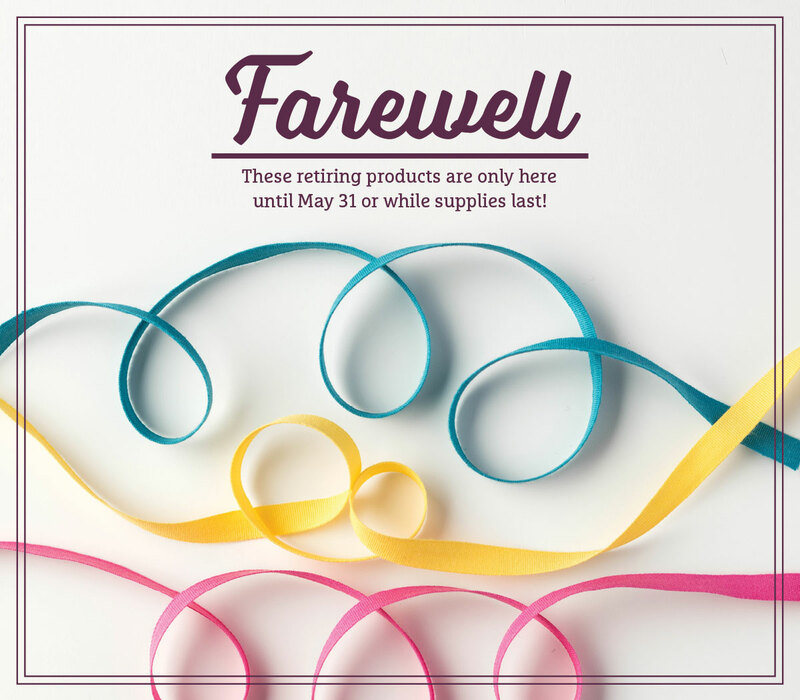 While some bundles (stamp set with coordinating dies or punch) may not be retiring, they will not be returning as specially priced bundles! This means that they will be offered separately at the new, full price. To take advantage of the special 15% bundle price, you’ll need to order before May 31st – even sooner, because they’re going fast! Have I whipped you into a shopping frenzy yet?! 🙂 I don’t mean to cause a panic, but I know that every year, I always have people coming to me, looking for products that have retired, sold out, and are gone! Don’t be a victim of eBay overpricing – shop now! Okay – now I’m going back to re-organizing my paper racks, so I can fit in my new In Colour cardstock, and make room for upcoming DSP. I’ll be back this evening with my Paper Craft Crew challenge card – I hope to see you then! Previous Previous post: Happy Birthday to Shannon West!